TechnicBRICKs: LEGO Technic Challenge 2012, warm-up! After a first hint from Jeppe at Technic blog, in May [1, 2] about a new Technic Challenge to come still this year, someone found today a related advertisement at the LEGO Club Magazine. 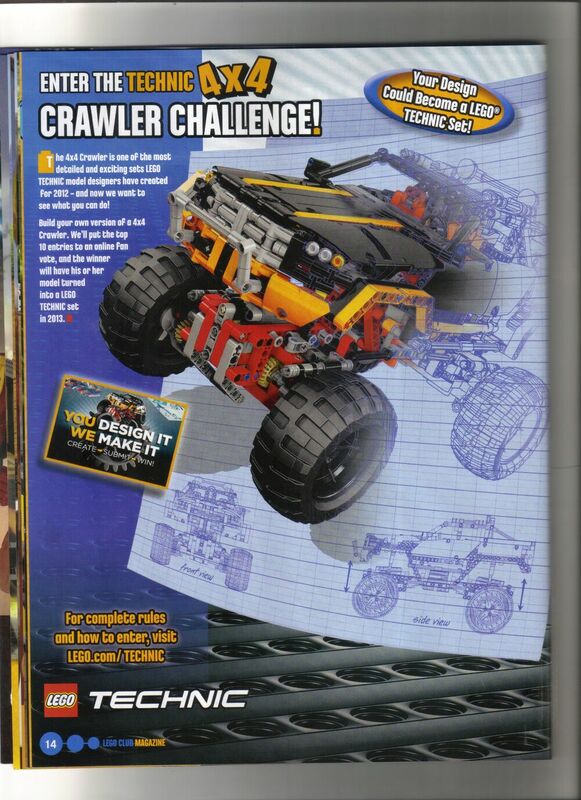 Not that it adds much details, but after previous rumors we got sure that the competition involves this year’s Technic flagship (9398 4x4 Crawler). You will have to build your own model and LEGO will select a short list, with the top 10 entries for the fans to vote! The winner will get the fabulous prize of seeing his model turned into an official set for 2013. Of course it won’t be that straightforward and the most voted model should be subject to a review process in order to make it producible and sellable. Basically to make sure it follows the same LEGO Technicr rules followed by their Designers and that target age group will be able to build the model without much trouble. I’m sure that more details will be out still this month. I’ll attend LFW at Skaerbaek (29-30.Sep) this year (looking forward to meet with some of you), and will bring the news from there if those won’t get published anytime before. cant wait to see the rules. there are buzzing many ideas in my head and i want to know the borders. So it's "your own version of _a_ 4x4 crawler". That means it can use the same functions as 9398 but doesn't have to - easier for younger entrants. I suspect some entries would have virtual 4x4 - imagined by virtue of off-road tyres rather than built-in! It means TLG will put out a set with the same or lesser functionality as 9398. It would be pointless to put out a very similar set with new instructions for a similar model, so I suspect a smaller set (one of the minor sets) is the aim. Maybe even the smallest set in the range as there is always a 4x4 of one size or another. It means a wide range of sizes and levels of functionality could be incorporated in the competition. It also says "turned into a set in 2013". That means it might not be available to buy till 2015, or might go with Cuusoo timescales. However, we have an opportunity to create the ideal Crawler: Polish the functional spec of 9398, perhaps add a second servo motor for crabbing like Bigfoot does (more sale-able to AFOLs)? Sort out the steering rake (try 45 degrees for the inner wheel and move the pivots inside the wheel centres). Add the Power Puller wheels. Then change the bodywork for something nicer, not 9398's mix of black & white, how about orange? I'm not likely to enter as I rarely build to a time limit, but I look forward to seeing how much PF functionality we could cram into a crawler!